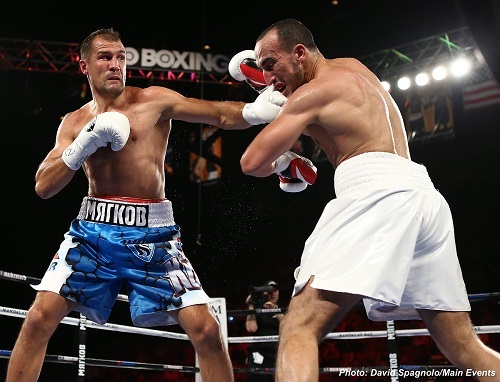 Sergey “Krusher” Kovalev utilised his trademark, ruthless efficiency, to KO unranked (not rated within the Transnational Boxing Rankings top ten) opponent Nadjib Mohammedi in the third round last night at the Mandalay Bay Resort and Casino, Las Vegas. The Russian, who entered the ring looking like a good sized cruiserweight, started patiently, firing a few hard jabs and right crosses in the opening round. Nadjib’s brave attacks at the beginning of the second merely helped focus Kovalev’s work, as Sergey immediately retaliated with cranked up potency in his own punches. A hard right cross, followed by a jab, right cross, and a clubbing right hook, sent Mohammedi to the canvas mid-way through the round. With thirty nine seconds remaining in round three, Sergey threw a right-lead, trailed by a left hand, the latter of which connected with his opponent’s left orbit. Neither appeared to be thrown with maximum force, but such is the exceptional power that Kovalev possesses, this was enough to end the contest – Mohammedi crumpled to the floor for the final time. This was a showcase fight for Krusher. He retains his position as the No.1 contender for the light heavyweight title. Make no mistake though, the title belongs to “Superman” Adonis Stevenson. Bernard Hopkins lost the light heavyweight title to Chad Dawson in their April 2012 rematch. In Dawson’s first defence, he got flattened by a monstrous left cross to the side of the head courtesy of Stevenson, losing the championship by knockout in round one. Adonis is, “the man who beat the man”, and is therefore the lineal champion at light heavyweight. (1) Stevenson has beaten four men who were ranked by the TBRB (Transnational Boxing Rankings Board) at the time he fought them: Chad Dawson (Champion), Tavoris Cloud (No.6), Tony Bellew (No.7) and Andrzej Fontfara (No.5). (1) Comparatively, in the same timeframe, Kovalev has beaten only three: Nathan Cleverly (No.5), Bernard Hopkins (No.1), and Jean Pascal (No.3). More vitally, Stevenson has not just beaten contenders – he defeated the champion. Kovalev’s impressive, 8th November 2014, one sided, twelve rounds decision victory over an almost fifty years old Bernard Hopkins elevated him to the top of the pile among the light heavyweight contenders. Stoppage wins over Pascal and Mohammedi have followed, but only victory over “Superman” will give Kovalev the satisfaction that he is truly the division’s best. Enticing super middleweight champion Andre “Son of God” Ward up to 175 pounds to challenge Kovalev is an intriguing fight, but not one that will prove Krusher is the best in his own weight division. Discouragingly, Max Kellerman barley mentioned the name “Stevenson” in last night’s post-fight interview, and instead concentrated on Ward. “What are your thoughts about fighting Andre Ward in the next couple of fights?” Kellerman asked Kovalev. Stevenson v Kovalev is the biggest fight that can be made at light heavyweight. During the five or so years it took to negotiate the richest fight in history, Manny Pacquiao showed clear signs of decline, and the shocking KO loss to Juan Marquez in 2012 could not have strengthened his confidence either. Floyd too, has showed evidence of deterioration, but fans will always wonder if a 2009-10 version of the Filipino would have fared any better against Money Mayweather than the 2015 version did. Kovalev and Stevenson are still in their primes, and a match-up between these two skilled, thunderous punchers is one of the most exciting bouts that can be made in boxing today. The powers that be were able to get Mayweather and Pacquiao in the ring together (eventually), so anything is possible. Boxing history has shown that if the two men want to make it happen, it will happen. Let’s hope they can overcome their contractual and television obligations, and quickly too, while a fight would still determine who the superior fighter really is.